New emoji candidates including a service dog, deaf people, and mixed race couples were added to the draft emoji list for 2019 at the most recent Unicode Technical Committee meeting. While these candidates aren't guaranteed entry into the Unicode Standard, this is a key step before the final emoji list is published in early 2019. These new additions join previous candidates for Emoji 12.0 such as flamingo, ice cube, sloth, and waffle which are all in the shortlist for release in 2019. Above: Shortlisted emojis for 2019. Images: Emojipedia Sample Image Collection. 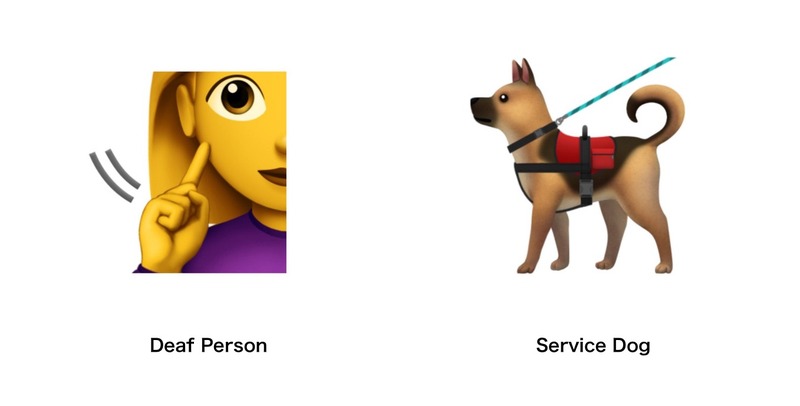 Above: Deaf Person and Service Dog are two new draft candidates for Emoji 12.0. Images: Apple. In addition, provisional candidates for 2020 have been shortlisted, including a ninja, magic wand, mammoth, feather, and dodo. 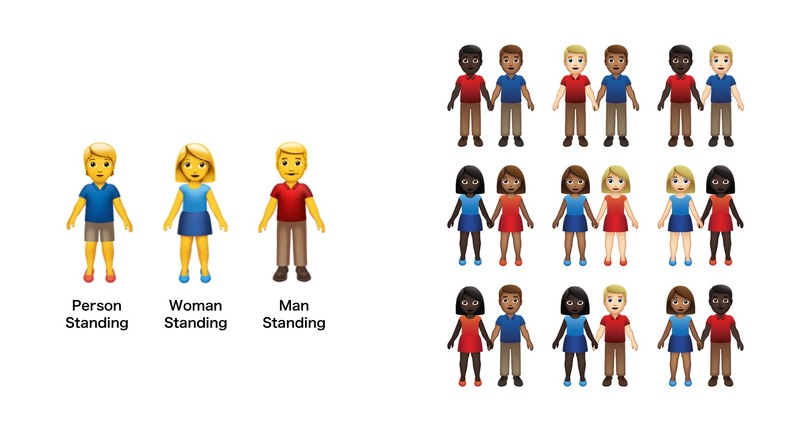 A new standing person emoji shortlisted for Unicode 12.0 is planned for use in the creation of new couple emojis. When combined with gender and skin tone characters, a total of 55 new mixed race couple options would become available. The proposal for these additions notes that this would be “25 female-male + 15 male-male + 15 female-female” couples. The resulting emojis would appear similarly to the existing people-holding-hands (👬 👫 👭) but with skin tone options applied to each person. Above: A new "person standing" character is used for the creation of mixed race couple emojis. Images: Modification of Apple emoji designs. Left (Emojipedia); right (Aphee Messer). Are mixed race families included? Unicode already provides a way for vendors to support mixed-race families, should any wish to do so. These are supported on Windows, and a subset where all family members share a skin tone are also supported on Facebook. 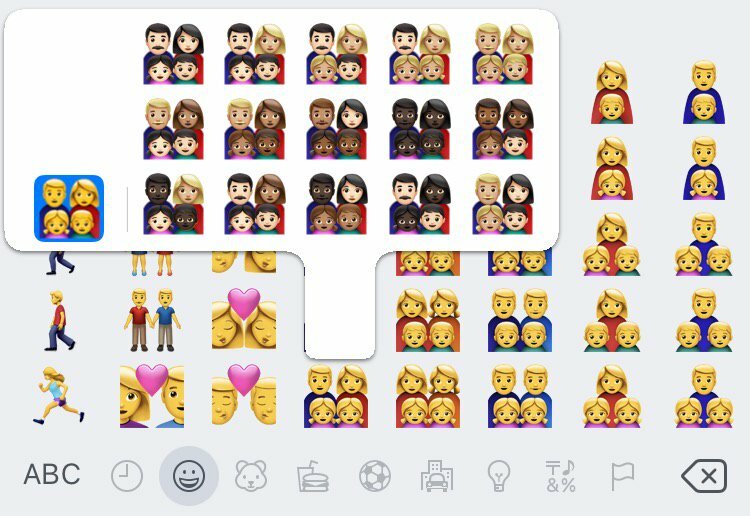 As of Emoji 12.0, no new family combinations are listed by Unicode, potentially due to the number of combinations required when three or four family members are included. Above: Mixed race families are possible within Unicode guidelines, but aren't part of Emoji 12.0. Image: Modification of Apple emoji designs (Emojipedia). Emoji 11.0 is the emoji list for 2018 which includes popular additions such as redheads, a mango, and kangaroo. These new emojis are rolling out on a number of platforms right now (Twitter website, Android, Windows Insider builds), and Apple has noted they are coming to iOS “later this year”. The additions listed today are for 2019 (and some early candidates for 2020). Above: Redheads, mango and kangaroo were part of the 2018 emoji list, and are coming to phones this year. Images: Apple. 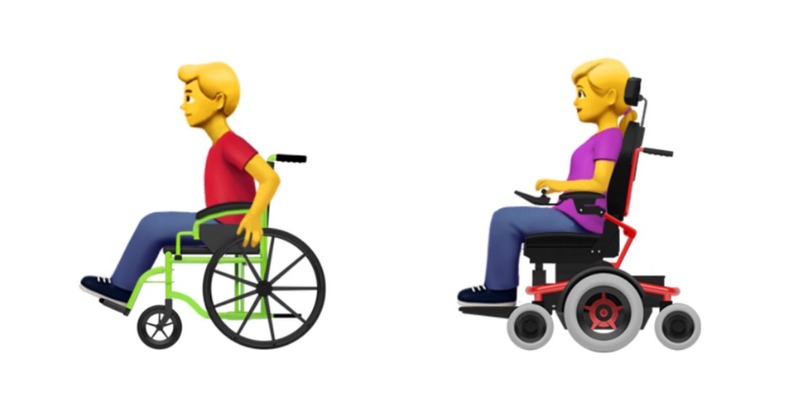 Apple proposed a slate of new accessibility emojis earlier in 2018, with some additions including a person with a probing cane, and person in a wheelchair. Accepted for Unicode 12.0 were a separate probing cane, manual wheelchair, and motorized wheelchair. These could be used in ZWJ sequences in future - pairing woman, adult, or man emojis with the wheelchairs or cane to create a single emoji. At the time of writing, the cane and wheelchairs have only been listed as objects in Emoji 12.0, and do not have sequences for people using these devices. Above: Wheelchairs are new candidates for Emoji 12.0, with possibilities to include people using them in future. Images: Apple. What's the difference between Emoji 12.0 and Unicode 12.0? Unicode 12.0 includes every new emoji (and all the non-emoji characters) that requires a unique code point. Emoji 12.0 also lists sequences, such as those required for skin tones, gender, or in the case of Emoji 12.0 - the service dog (which is a ZWJ Sequence of 🐕 Dog and a new Safety Vest emoji). One benefit of the move is that vendors will have more time between an emoji list being published, and the NoHem “fall” schedule for most major OS updates. Don't let the January-March 2019 schedule fool you, any approved emoji additions aren't likely to hit phones until the second half of 2019. Most of us don't even have the 2018 updates, yet!